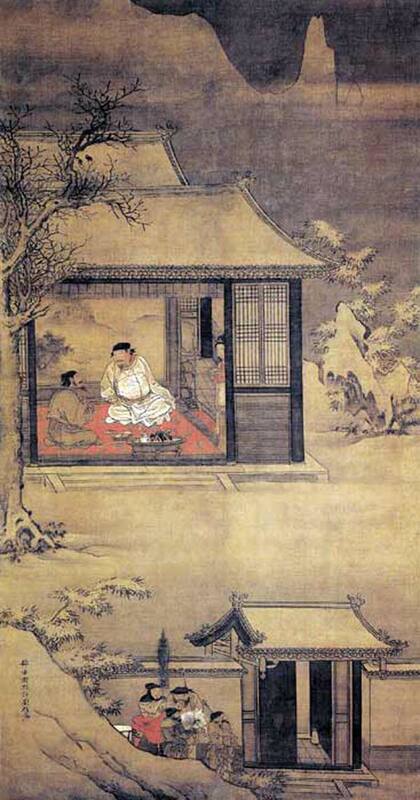 This is one of two "evening talk" melodies to appear in the first part of the Ming dynasty.4 The other, Evening Talk by a Guest's Window, is connected to Liu Ji, an advisor to the founder of the Ming dynasty. The present melody, though sometimes connected to an advisor to the founder of the Song dynasty, in fact evokes a variety of images, some connected to nature, others to Confucian philosophy. Knowing details of this can enrich one's understanding of the melody, but it is also quite possible that the surviving versions come from a lost prototype that originally had no specific explanation, or that was simply inspired by, or intended to evoke, an image such as two friends having a quiet conversation by a window on a snowy evening. Versions of Xue Chuang Yehua were apparently quite current in the 16th century, as at least seven publications of it survive from the one published in 1539 (see below) to the last one, dated 1596.5 Though related, all are quite different and two have lyrics. In addition, the Chang Ce published in 1525 is clearly another version of this same melody.6 However, none of these has any apparent connection with the music or lyrics of Evening Talk by a Guest's Window. The Xue Chuang Yehua in Fengxuan Xuanpin (1539), the second surviving version, has lyrics and section titles but no preface.7 The lyrics, which may not have been intended for singing,8 do not mention proper names, but they clearly tell the story of a snowy evening conversation between a ruler and an advisor, connecting it to the story, told with at least one later version of the melody, of Zhao Kuangyin (927 - 976), first emperor of the Song dynasty, visiting his trusted advisor Zhao Pu,9 on a snowy evening. This story and its lyrics make the theme of that version of the melody solidly Confucian: the snowy setting simply emphasizes the devotion of the two men to Zhao Pu's Confucian principles of government. Xie Anshi together with his nephew 謝朗 Xie Lang and niece Xie Daoyun were writing poems about snow. Xie An said, "A great snowfall has myriad flakes going in all directions. What does this resemble?" Xie Lang said, "Throwing salt into the air is rather like it." Daoyun said, "It more resembles willow catkins wafted by a breeze." Xie An was very pleased with this response, and so this melody was named. Looking carefully at the meaning behind this melody, it truly has the appearance of a family and its father intimately together by a quiet window. People in former times were so lofty that they not infrequently had such thoughts. 43160.169 雪窗 xuechuang ("snow window") is a short entry quoting the Tang poets 鄭谷 Zheng Gu and 黃滔 Huang Tao. 11/628 adds a quote from a poem (玉樓春) by 宴幾道 Yan Jidao (12th c.; Indiana Companion, p.922), but none of these seems particularly relevant to the stories directly associated with this melody. 雪窗螢火 or 雪窗螢儿 Snow(-lit) Window and Firefly (Light) tells of 孫康 Sun Kang (4th c. CE; Bio/775) and 車胤 Che Yin (d. 401 CE; Giles: Ch'e Yün; Bio/267) being too poor to afford a lamp, so they studied at night by a window from light reflected off the snow, or by the light of fireflies collected in a bag. Snow-lit Window and Firefly Light came to be a phrase for hard study, as in Chapter One of the famous opera 西廂記 Western Chamber Romance (see West and Idema, The Moon and the Zither, p.173), where the scholar Zhang uses this phrase to describe the difficult studies of his own childhood. But again, none of this seems particularly relevant to the present melody. On the other hand, the Moon and Zither story does express a Confucian ideal similar to that in the story called Visiting Pu on a Snowy Evening (11/624 雪夜訪普 has a quote from 儒林外史 The Scholars [FLP, p.89]). According to this story, the first Song emperor 趙匡胤 Zhao Kuangyin met his advisor 趙普 Zhao Pu on a snowy evening to discuss affairs of state. Visiting Pu on a Snowy Evening later became a phrase referring to any such meetings. However, this story makes no mention of a window. For "evening talk" see below. The proper name for this painting, which can be found copied on a number of websites, is 雪夜訪普圖 Visiting Pu on a Snowy Evening. The painter was 劉俊 Liu Jun (early Ming; dates uncertain); the original is in the 北京故宫博物院藏 Museum of the Forbidden City, Beijing. 5890.228 and 2/362 夜話 yehua (晚間敘談 "evening chat") have quotes only from Bo Juyi (招東鄰) and Su Shi (答周循州 and 二十年目睹之怪現狀 #45); none mentions snow. Zha's Guide 15/160/348 lists six occurences of Xue Chuang Ye Hua; adding 1552 makes seven. In addition, Chang Ce (1525) is another version of the same melody. See next footnote and the chart below. Regarding “ce”, modern dictionaries all have "inclination" or the like. 893 and 1//1540 側 also give various other meanings including "伏 hidden" and "特 special" but this has not as yet helped me understand its significance here. Chang Ce survives as a qin melody only as #38 in Xilutang Qintong (1525), but it is clearly related to Xue Chuang. Besides the melodic relationship throughout, two versions of Xue Chuang (see 1559 and 1561 in the chart below) mark their Section 4 (comparable to 1525's Section 6) "長" (Chang) at the beginning and "側" (Ce) at the end; Section 10 is then defined as "長至側" (From Chang to Ce), followed by a short closing. The middle of Chang Ce Section 4 has the opening of the passage later called "From Chang to Ce", but this is only about 1/5th of the whole passage as found in versions called Xue Chuang; the rest seems to be missing. My Fengxuan Xuanpin Commentary has a footnote discussing melodies that may not have been intended for singing. The main problem singing them is the density of text, with one character for each note of a slides or an arpeggio (gun and fu) as well as for each right hand stroke. I have written out a transcription for the Fengxuan Xuanpin version, with its lyrics. It can be played quite nicely as a purely instrumental melody, but I haven't completed a translation of the lyrics and have not worked out the textual problems. So the version I actually play is the one published in 1525. See QQJC III, p.114. I usually make a point of learning the earliest published version of any surviving title. Here I learned the 1525 version because of problems, mentioned in a footnote above, with the 1539 version with lyrics. I encountered a similar situation with the 1539 Yang Chun, and so learned the Yang Chun from 1525. Xie Daoyun, a niece of 謝安 謝安 Xie An, was the wife of 王凝之 Wang Ningzhi (21295.1813, a son of Wang Xizhi and a calligrapher in his own right). She was naturally intelligent (36661.258 聰識有才辨 ; Bio/2382 夙慧) and well-educated. The story of her poetically describing snow is related in 晉書, History of the Jin Dynasty, Book 98. Women Writers of Traditional China, p. 721, has a brief biography and many references to her, saying she was "celebrated" in Shishuo Xinyu. More detailed information is given by Lily Xiao Hong Lee in Xie Daoyun: the Style of a Woman Mingshi, a chapter from Dr. Lee's The Virtue of Yin (Wild Peony, Sydney, 1994). Xie Daoyun's marriage was apparently not happy: her husband and his family were all highly educated, but perhaps she felt Wang Ningzhi himself was an overzealous follower of the 五豆米 Five Pecks of Rice religious sect. However, she was loyal to him and, after he was killed by bandits, she herself fought and killed several of them; afterwards she lived a chaste life as a widow. Apparently it was this, rather than her intelligence, that led to her biography being included amongst the Exemplary Women in the History of the Jin dynasty. And although she is known to have written a number of poems, only a few have survived (they are translated in Dr. Lee's book cited above). Many women of later dynasties, especially in Ming and Qing, who aspired to write poetry, or whose parents hoped that they could, have names containing the character 韞 yun (as in Xie Daoyun), 雪 snow or 絮 catkin, apparently referring to this story of her. She embodies female talent in Chinese literature and art. It is not difficult to see why Xue Chuang Ye Hua is connected to Daoyun. It seems to me that the whole composition is inspired by that conversation Xie An had with his nephews and nieces during that wintry night when they saw through their window snow flakes fluttering by. 大雪紛紛何所似？ is sometimes written, 白雪紛紛何所似? Although both this melody and Evening Talk by a Guest's Window are grouped with shang mode melodies, they are never placed next to each other.